Philip Glass’ string quartets may contain his most intimate music. They are works through which a very public composer, perhaps the most important opera reformer of our age and a longstanding collaborator in large-scale music theater, holds up a mirror to himself and his way of composing. Even Glass’ most loyal listeners may be surprised to learn that he has written eight quartets to date. His first three compositions, he says, were string quartets — student works, now discarded. His first numbered quartet was written in 1966, in Paris, shortly after Glass had finished his studies there with Nadia Boulanger and had been introduced to the music of India by Ravi Shankar. It is the culmination of Glass’ earliest attempts at a highly reductive style, containing a series of short sections comprised of tiny repeated motives, and it proved the precursor of the classic minimalist technique he was soon to develop. Glass did not return to the string quartet medium until 1983, when he provided incidental music for a dramatization of Samuel Beckett’s prose poem, Company. During those seventeen years, Glass had formed an ensemble and developed his motoric, repetitive style in a series of increasingly elaborate pieces for it; he had produced a large body of music for dance, theater and film; and he had written four operas. In the process, he had further enriched his harmonic, rhythmic, melodic and structural procedures with each succeeding work. Offered the resources of traditional opera houses, Glass had also (in Satyagraha, Akhnaten and the Rome Section to Robert Wilson’s mega-opera, the CIVIL warS) begun adapting his musical language to the requirements of standard musical forces — singers and orchestra. Over the eight years following his music for Company, he increasingly re-entered the musical mainstream. While still devoted to his own ensemble of electric keyboards, winds and voice, he continued making operas, created more music for film and dance and theater, and wrote a violin concerto and other orchestral works. Indeed, the tone of the Fifth Quartet is a luminous one, set in the very opening bars, where a pluck and a shimmering leap up through the instruments transforms the trademark Glass arpeggio into a sweet bell-like announcement. Similarly transformed are all of the familiar conventions of Glass’ style, his rhythmic and harmonic fingerprints, his elusive repetitiveness where subtle shifts continually occur. Like much of Glass’ music, the Fifth Quartet is a study in contrasts. Fast-moving rhythmic sections contrast with slow, chordal ones. Dynamics shift, loud and soft. The introduction’s tone pervades the quartet, not only in the way the material from the opening becomes increasingly incorporated into a traditional structure of four connected main movements but also in Glass’ seemingly effortless ability to resolve his contrasts. In the second movement, a syncopated, swaying, barcarolle-like melody in shifting meters alternates with the plucked and bowed chords of the introduction, unified by a rocking bass pattern. In the scherzo-like third movement, a continually evolving dance-like figure initially alternates with a more regular, propulsive rhythmic passage, but gradually the two come together to form a transition to the rapturous, long melodic lines of the next, slow movement. A quicker middle section to that movement prepares for the soaring scales of the fifth movement, into which the quartet’s introductory material gradually returns, the two merging into a transcendent weightless resolution. The incandescence of Glass’ Fifth Quartet may come in part as a reaction to the somber, muted mood of the String Quartet No. 4 (“Buczak”), which was composed in remembrance of the artist Brian Buczak, who died of AIDS in 1988. Written in three movements, the first begins with a melancholy sequence of chords, in slow, regular, almost funereal succession, followed by a series of variations that explore the variances of Glassian arpeggio and figuration, their arc form reaching a restrained but still impassioned climax before receding into repeated-note patterns. The slow central movement contains one of Glass’ most exquisitely scored melodies, first soaring high and slow in the violins an octave apart against thick, decorated whole-note chords in viola and cello below, creating a startling sensation of the spirit leaving the body. A new regular chord sequence begins the last movement, which leads to comforting scalewise melodies and cadences, a warm and necessary return to the familiar but no longer quotidian world of the living. The seeds of the Fourth Quartet, in its use of the four strings to create a valedictory ambiance, can be found in the four very short movements of Company, written originally to accompany a 1984 staged version by Mabou Mines, the theater company with which Glass had long been associated. Company is a soliloquy in which a man, presumably at the end of his life, hears a voice of his past and comes to terms with a profound solitude. It was this introspective nature of the soliloquy that led Glass to return to the quartet form, although he intended the score to stand on its own as a concert work (String Quartet No. 2) as well. In the staging, the music, as elliptical as Beckett’s prose, appears at moments of silences. “When I sent Beckett the music,” Glass recalls, “he said, ‘Oh, very good. It will appear in the interstices, as it were.’ ” Glass says that he doesn’t know what Beckett’s response to the music itself was, or if he ever saw the production, but that he gave his approval. Glass’ String Quartet No. 3 is also adapted to dramatic music, this time from his score to the 1985 Paul Schrader film, Mishima. The film, framed by the day of Yukio Mishima’s highly theatrical suicide, is a biography of the controversial Japanese writer with interspersed dramatizations of his novels. And for the three elements, Glass chose to write three different types of music: a large orchestra accompanies the novels; a string orchestra concentrates on the last day; but it is the string quartet that characterizes Mishima’s life and those in it (with the string quartet at the end merging into a string orchestra for Mishima’s death). Again Glass found it natural that the string quartet should reflect the most personal aspects of the film. But despite specific connotations to the film music — themes for Mishima’s grandmother, his body building, his extremist right-wing advocacy — Glass says that he also conceived the string quartet sections, like the pieces of Company, as independent music that could stand alone as a concert suite. It was also with the music of Mishima that Kronos became associated with Glass, recording the string quartet sections of the Mishima soundtrack, and subsequently working extensively with the composer on all five of his numbered quartets. 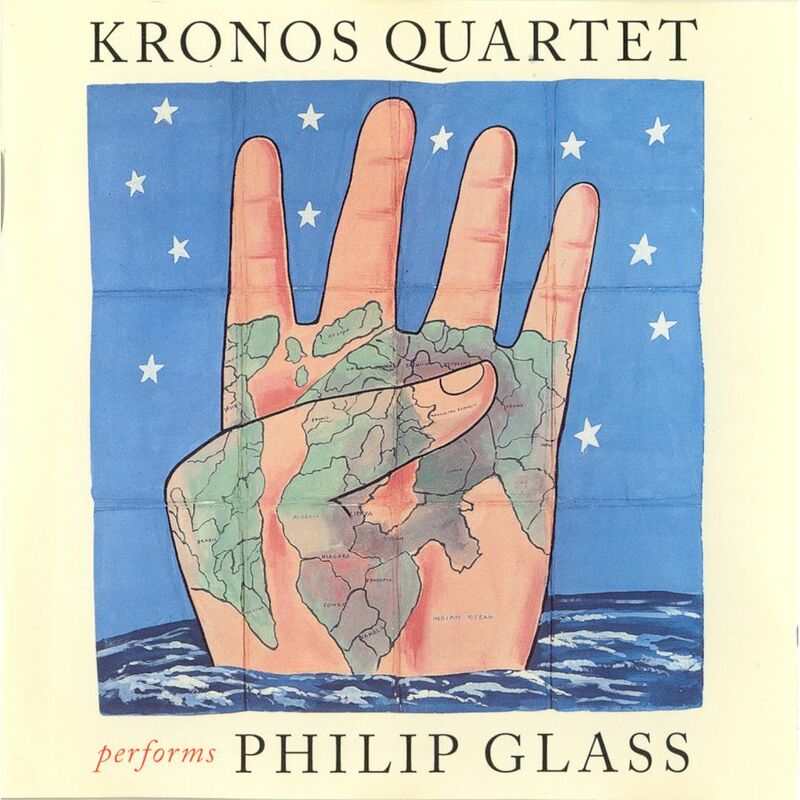 Kronos gave the first concert performances of Glass’ String Quartet No. 1 (which the ensemble discovered and premiered in 1986, twenty-two years after it was written), Company and Mishima. The Fifth Quartet was commissioned for Kronos by David A. and Evelyne T. Lennette. The Fourth Quartet was commissioned by Geoffrey Hendricks in memory of Brian Buczak. Music Composed by Philip Glass. Performed by Kronos Quartet: David Harrington, violin. John Sherba, violin. Hank Dutt, viola. Joan Jeanrenaud, cello. Produced by Judith Sherman, Kurt Munkacsi and Philip Glass. Recorded at Skywalker Sound, Marin County, California. Engineer: Craig Silvey. Assitant Engineer: Tom Luekens. Edited by Judith Sherman. Mastered at Soundbyte, New York, New York. Cover: The Four Corners, © 1985 by Franceso Clemente. Design by Frank Olinsky. Executive Producer: Robert Hurwitz. Music Published by Dunvagen Music Publishers, Inc. New York (ASCAP). © 1995 Nonesuch Records.